Welcome to the second part of the Enlightenment Desktop Environment customization guide. This guide will show you how to make your Linux desktop work exactly how you want it to. In the first part, you learned how to change the desktop wallpaper on multiple workspaces, how to change the themes that applications use, how to install a new desktop theme and how to add transition and compositing effects. Everybody has applications that they use all the time and applications that are used more sporadically. Good desktop environments provide a method for making your favorite applications easily accessible. With the Enlightenment desktop environment you can create an IBar with a series of icons for your favorite applications but on top of this you can also define your favorite applications so that they appear on the menu under a favorites sub-category and also on the context menu which is accessible by right clicking with your mouse. I will cover IBars and shelves in a future guide but today I am going to show you how to define favorite applications. Open up the settings panel by left clicking anywhere on the desktop and choosing "settings -> settings panel" from the menu that appears. When the settings panel appears click on the "Apps" icon at the top. A new list of menu options will appear. Click on "Favorite Applications." A list of all the applications installed on your computer will appear. To set an application as a favorite click it until the little circle lights up. When you have finished lighting up applications in this way press either "Apply" or "OK."
The difference between "Apply" and "OK" is as follows. When you click "Apply" the changes are made but the settings screen remains open. When you click on "OK" the changes are made and the settings screen closes. To test that the applications have been added as favorites left click on the desktop until the menu appears and there should be a new sub-category called "Favorite Applications." The applications you added as favorites should appear within the sub-category. Another way to bring up your favorite applications list is to right click on the desktop with the mouse. Every so often the changes don't appear to have worked. If this happens you might need to restart the desktop environment. This can be done by left clicking on the desktop and from the menu choose "Enlightenment - Restart." You can change the order of the favorite applications. Click on the order link at the top of the favorite applications settings window. Click on each of the applications and then click on the "up" and "down" buttons to change the order of the list. Click "OK" or "Apply" to save the changes. This section will show you how to set the default applications for various file types. Open up the settings panel (left click on desktop, choose settings -> settings panel) and from the apps menu choose "Default Applications." A settings screen will appear that will allow you to select the default web browser, email client, file manager, trash application and terminal. To set the applications click on each link in turn and then choose the application you want to be associated with it. For example to set Chromium as your default browser, click on "browser" in the left pane and then in the right pane choose "Chromium." Obviously you will need to have installed Chromium first. 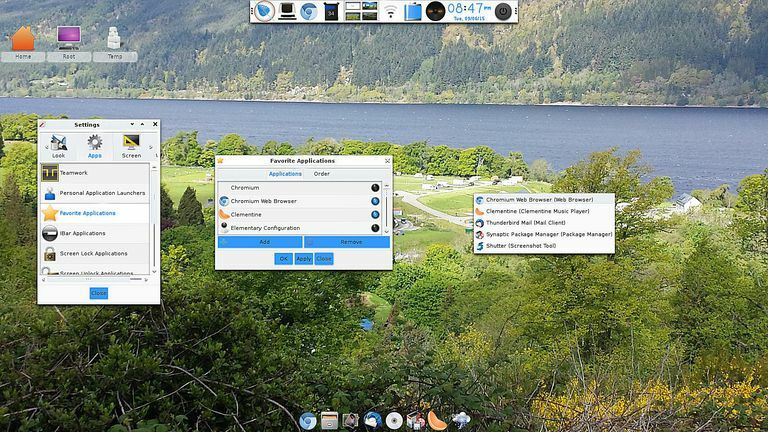 Within Bodhi Linux you can do this by using the App Center. Obviously this screen only deals with a few core applications. If you want finer granularity so that you an select the program to be associated with xml files, png files, doc files and every other extension you can think of and probably many more choose the "general" link. From the "general" tab you can click on any of the file types in the list on the left and associate it with an application. How can you test whether the settings have worked? Click on a file with a .html file extension after setting Chromium as the default browser. Chromium should load. When I get to work in the morning there are a number of applications that I start everyday without fail. These include Internet Explorer (yes I work with Windows during the day), Outlook, Visual Studio, Toad and PVCS. It makes sense therefore to have these applications in the startup list so that they load without me having to click on the icons. When I am at home 99.99% of the time I want to use the internet and so it makes sense to have a browser window to open at startup. To do this with the Enlightenment desktop environment bring up the settings panel and from the applications tab choose "Startup Applications." Generally you will want to leave the system applications alone. To start a browser or your email client on startup click on the "applications" tab and select the applications you wish to start and then press the "add" button. Click "Apply" or "OK" to make the changes. You can test out the settings by restarting your computer. You might have noticed that I skipped over the "Screen Lock Applications" and "Screen Unlock Applications." I tried both of these options out and they didn't do what I expected them to. I thought that by setting applications as screen lock application this would make those applications available even though the screen is locked. Sadly this doesn't appear to be the case. Similarly I figured that screen unlock applications would cause applications to load after entering the password to unlock the screen but again sadly this doesn't appear to be the case. I tried looking for documentation on these screens but this is fairly thin on the ground. I also tried asking in the Bodhi and Enlightenment IRC rooms. The Bodhi team tried to help but had no information as to what these screens are for but I couldn't get any information from the Enlightenment chat room. If there are any Enlightenment developers that can shed light on this please contact me via the G+ or email links above. Note that there is a "restart applications" option in the settings panel. These applications start whenever you restart the Enlightenment desktop and the settings screen works in exactly the same way as the "Startup Applications." That is it for today's guide. In the next part I will show how to adjust the number of virtual desktops and how to customize them.